People are companies’ most important assets. We’ve all known this for a long time, but 1) we pay it lip service more often than we try to do something about it, and 2) it’s true more now than ever. The rise of technology and the information age has resulted in more companies that compete based primarily on their people. This isn’t only true for technology companies like Facebook and Google; as software continues to eat the world and the pace of business increases, nearly all companies will live and die by their continual ability to innovate. Despite the fact that most organizations know that their long term advantage resides in their people, most companies don’t think critically about how to increase employee retention. In this post, I’ll argue that the core reason people don’t think about employee retention seriously enough is because they don’t know how to measure the impact. I’ll then share some frameworks for how you might associate dollar values with regrettable turnover, and once I’ve (hopefully) convinced you that this matters, give you some actionable ideas for improving the state of affairs. People instinctively sense this; we’ve all felt the pain of a superstar leaving, the cultural challenge associated with the departure of a beloved employee, or even just the painful gap that is left behind by an employee who was doing an important job well. But most people have no framework for quantifying this cost, or they never even bother to try. The problem with this is that people tend to optimize what they can measure. Doctors believed that cigarettes were bad for human health as early as the 18th century, and scientific studies about the link between smoking and lung cancer started surfacing in the medial literature as early as the 1920s. 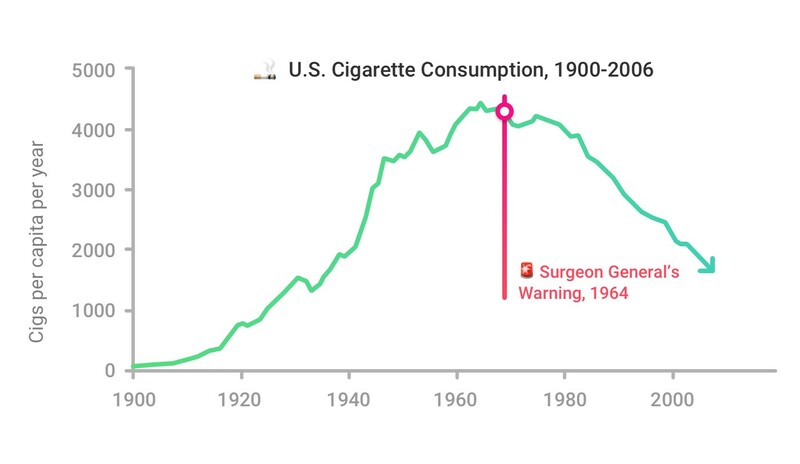 Even though people generally knew cigarettes were bad for you, it wasn’t enough, and smoking in America surged dramatically during the first half of the 20th century. The U.S. government started running extremely effective public service campaigns over the following decades about the number of years cigarettes shaved off your life, the specific diseases you would contract and how likely you’d be to get them, and the effects on loved ones who are exposed to your second hand smoke. In order to help people to do something difficult but valuable, such as quitting an addictive habit, a critical first step is to help them understand the cost of not doing that thing. Employee turnover, like cigarettes in the 1920s, is generally understood to be bad, but there is little awareness of its quantifiable impact. 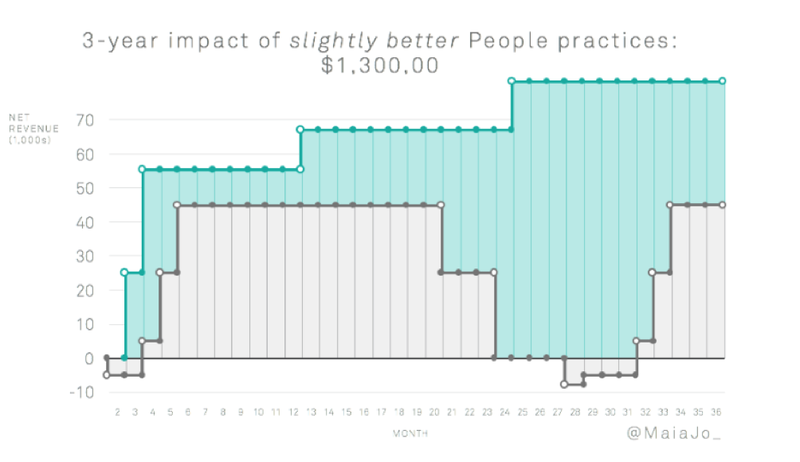 A visual way to gain a mental framework for the cost is to simply draw a graph of an employee’s value to the company over time. Maia Josebachvili, VP of of People at Greenhouse, produced a case study where she argued that retaining a sales person for three years instead of two, along with better onboarding and management practices, yields a difference of $1.3 million in net value to the company over a three year period. Slightly more conservatively, Josh Bersin of Deloitte believes the cost of losing an employee can range from tens of thousands of dollars to 1.5–2.0x the employee’s annual salary. These costs include hiring, onboarding, training, ramp time to peak productivity, the loss of engagement from others due to high turnover, higher business error rates, and general culture impacts. Employees, Bersin explains, are appreciating assets that produce more and more value to the organization over time, which helps explain why losing them is so costly. Others sources peg the cost of regrettable employee turnover at a higher level. A paper from the Center for American Progress, citing 11 research papers published over a 15-year period, determined that the average economic cost to a company of turning over a highly skilled job is 213% of the cost of one year’s compensation for that role. No matter how you slice it, the cost is high. But how high is it for you? 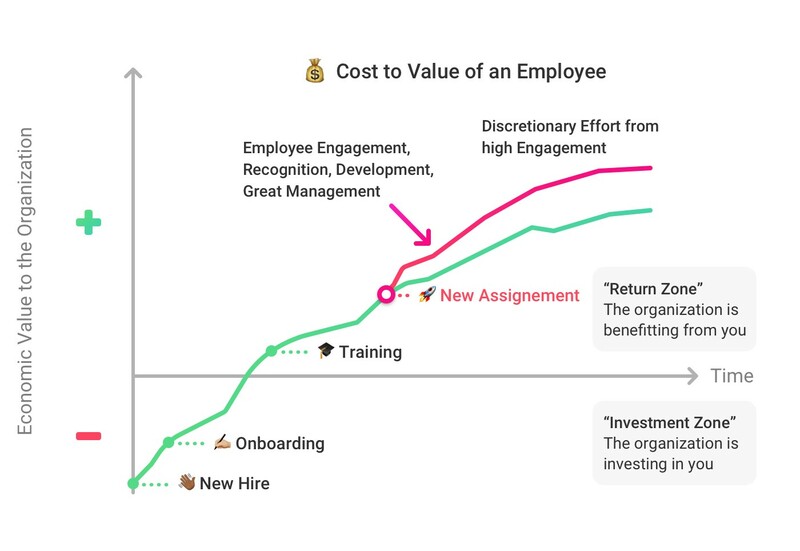 To help you quantify this, we’ve put together a simple formula: your company’s cost of employee turnover is equal to the number of regrettable departures times the average cost of those departures. The number of regrettable departures will simply equal your number of employees times your annual turnover percentage. As an example, if you are a 150 person company with 11% annual turnover, and you spend $25k on per person on hiring, $10k on each of turnover and development, and lose $50k of productivity opportunity cost on average when refilling a role, then your annual cost of turnover would be about $1.57 million. Reducing this by just 20%, for example, would immediately yield over $300k in value. And that says nothing of the emotional headache and cultural drain felt from losing great people. You can use this spreadsheet to plug in your own numbers to get a sense of what the costs look like for you. Alright, so we know it’s expensive. But what can be done? First and foremost, acknowledge that there are some problems that you can solve by throwing money at them, but employee satisfaction isn’t one of them. Multiple studies show that while under-compensation can definitely contribute to employee churn, over-compensation won’t make up for a bad workplace. Your well paid but unhappy employees will simply leave you and make their money somewhere else. So view market-rate compensation simply as table stakes, and spend your energy focused on the next level of Maslow’s hierarchy of employee happiness: opportunities for growth, the ability to have impact towards a purpose, and a caring environment that makes them feel valued. Growth is fundamental to human happiness; the hedonic treadmill was built into all of us, and humans constantly seek growth and change. The craving for growth is especially visible for the younger generation that is coming to dominate the workforce. Younger workers are more easily able to prioritize things like personal growth and career opportunity over income and job security. Have you had conversation with your employees about their long-term personal goals? When a capable person on your team wants a role bigger than her past experience, do you give her a shot or do you simply hire someone with more experience? When people need to acquire new skills to advance their careers, what does your company do to help them? If you don’t build a culture that deliberately provides good answers to these questions, it’ll be a matter of time before your employees start looking for a workplace that does. Impact applies at two levels; the impact your company is having on the world, and the impact an individual is having on your company. People want to know that what their company is working on matters. Articulating a clear and purposeful company mission is important not just because it help people prioritize their work, but because it helps them keep going through hard times and know they’re part of something that matters. To give a tangible sense of impact, they need to know that what they’re working on is contributing to a mission that matters. If someone builds and launches a new product they will certainly feel some satisfaction, but if they can say, “I built a new product which is going help our company accomplish a much broader mission” that will mean much more to them. Finally, and just as critically, is creating a workplace that cares. Feeling cared for and recognized addresses another basic human requirement; the need for human relationships and for others to acknowledge to us that we matter to them. You need to build a culture where people respect and appreciate each other. A culture of care and appreciation doesn’t mean throwing around constant, meaningless praise. Instead it’s an authentic care for others’ best interest, which can’t be faked and has to be built over time. An environment where people feel like their coworkers have their best interests in mind comes with all kinds of benefits. Critical feedback will be more easily accepted. Frank conversations about what’s required for employees to make it to the next level will happen more naturally. Managers will want to see their teams succeed and work hard to empower them. And, of course, employees will feel happier on a day to day basis knowing they are surrounded by people who don’t just want something out of them, but want something for them. In a world where people are an organization’s most essential assets, companies need to be more strategic about how they think about employee retention to remain competitive. Employees are just humans who happen to be at work. You’ve hopefully learned some ways to make other humans happy in your personal life, so take that knowledge and apply it to your workplace. Once the basic need of sufficient income and job security has been met, move up Maslow’s hierarchy of needs and create a culture that enables growth, impact, and care. It’ll save you a ton of money, help you stay competitive in your industry, and make the place you spend most of your waking hours much more enjoyable. Enjoy reading? Click the little heart below to help spread the word! Thanks to Alex Kracov, Eric Stromberg, Connor McSheffrey, Jarred Sumner, and Ming Lu. HR blog from the creators (and friends) of Lattice.